you want in super fast time! If you are a new advertiser, posting a StarAd will cost you $98. Your Advertisement will be posted up until your vehicle is sold, and will get StartAd exposure for 1 day. If you are an existing advertiser, upgrading to StarAd will cost you $58. Your advertisement will get StarAd exposure 1 day. There are over 10,000 used vehicle for sales in sgCarMart. Posting a StarAd is the only way to stand out. With StarAd, your selling points get right in the face of potential buyers. Why should I add-on StarAd? 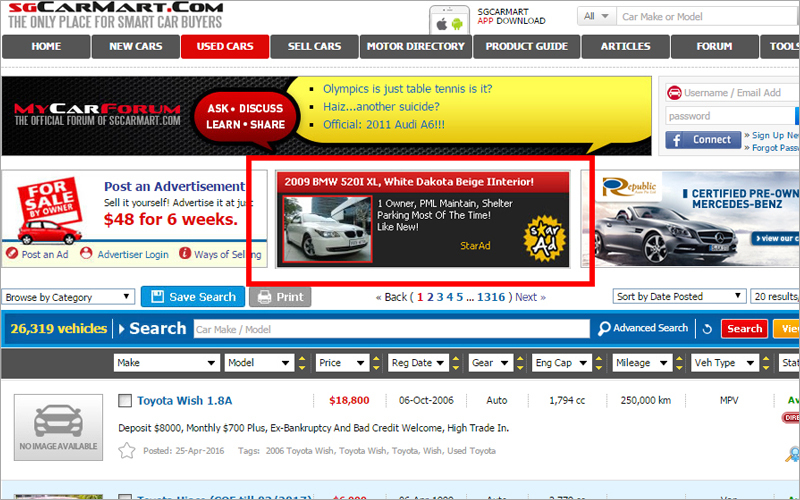 StarAd is sgCarMart's premium advertising with increased exposure. 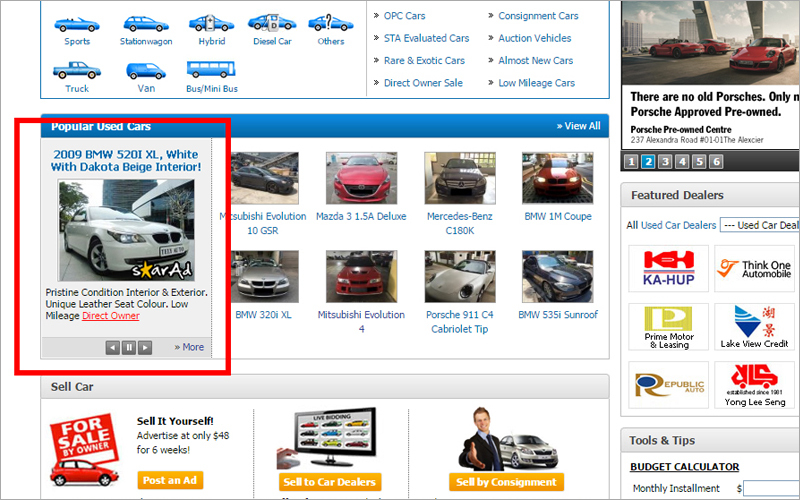 You can choose to list your car as a new StarAd or add-on to your Standard Ad at anytime. StarAd includes priority search ranking, top visibility on our Used Cars landing and listing pages, and over 100,000 additional views. Why is StarAd cheaper for a new advertiser? If you are a new advertiser, posting a new StarAd will cost you only $98. However, adding on StarAd to a Standard Ad will cost an additional $58 - meaning $58 (Standard Ad) + $58 (StarAd add-on). You'll save $18 if you choose to post your advertisement with StarAd from the start. How long will my advertisement be listed as a StarAd? Your advertisement will be listed as a StarAd for 24 hours starting from the time of activation. You can choose to add-on to your Standard Ad at any time via your advertiser login. 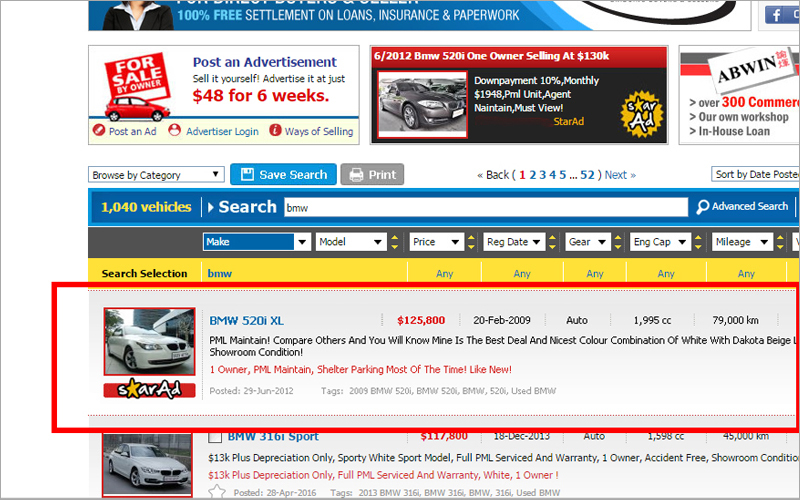 Once the 24 hours are up, your advertisement will revert to Standard Ad until your vehicle is sold. Can I choose when my StarAd will appear on sgCarMart.com? You can choose to activate your StarAd either immediately, or select another day within the next 7 days. Should you choose to activate your StarAd on a separate day, your ad will automatically be listed from 0000hrs to 2359hrs on your selected date. sgCarMart is the number one car classifieds for buying vehicles like sports car, hybrid car, COE cars, OPC Car, hatchback, stationwagon, MPV, SUV, van, truck & parallel imported cars. Buy from new car dealer, parallel importer, car auction, etc. Also find useful products & services like car audio, car polishing, solar film, car accessories, car parts, car repair, car workshop, car bodykit, car tyre, sport rims, car mat, car stickers, car rental, car blog, lorry rental, van rental, bus rental, & truck rental.